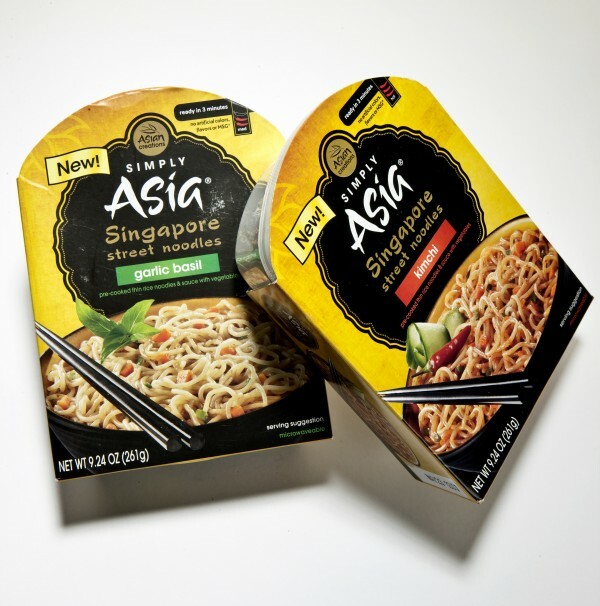 Microwaveable eats dubbed Singapore Street Noodles from Simply Asia. Each bowl includes three packets (rice noodles, sauce, dehydrated vegetables) in garlic basil, kimchi, sesame ginger and classic curry flavors. On average, there are 42,686 items available in supermarkets, according to the Food Marketing Institute. Each year hundreds of new products are brought to the shelves by companies wishing to have us part with our dollars. What can we expect will be new in 2014? According to a study published this past June, Shopping for Health 2013, shoppers need help making healthy eating choices. Lack of motivation and cost are two obstacles often noted as excuses. Rather than seeking out healthy food items, shoppers’ top healthy eating pick is to avoid foods viewed as unhealthy. Customers report switching to healthier snacks (56 percent), avoiding junk food (62 percent), making conscious efforts not to consume too many calories at once (52 percent), and preparing healthy recipes at home (59 percent). Consumers also have been switching to healthier versions of foods they already consume. The largest rise has been seen with yogurt, with 34 percent of shoppers choosing a healthier version such as Greek yogurt or a probiotics variety. More shoppers are buying foods that contain whole grains. When a product is labeled with a specific health-related ingredient, 48 percent of consumers buy “whole grain,” 43 percent “multigrain,” 34 percent “low fat,” and 32 percent “low sodium.” The number of shoppers buying “vegetarian,” “no fat,” and “sugar free” has remained the same. In 2012, store brands experienced a record year, totaling $59 billion in sales. Starting in 2006, retailers started to put more money into store brands, pricing them wisely and hiring graphic designers to create attractive labels. Emphasis on store brands will continue to rise, according to the study. Flavor trends for 2014 will include heat and sweet and salty flavors, the spicier and bolder the better. Sweet and savory is expected to be big, such as new chocolate-dipped Lays wavy potato chips. Other examples are salty caramel and M&Ms with a salty and sweet mix. Consumer preferences in frozen meals are becoming more specialized, with more ethnic flavors being demanded. Once, just offering Mexican food was enough. Now people are looking for foods from certain regions of Mexico – just mole isn’t acceptable, it needs to be Oaxacan mole. Korean flavors are expected to be big, with kimchi, a traditional Korean dish of fermented vegetables including cabbage, leading the way. Additional growing demand in the frozen food industry is expected for semi-homemade meals made with fresh, high-quality ingredients. The latest and greatest in packaging appears to be the pouch. Put just about anything in a pouch and it will sell, except Heinz ketchup. The pouch was harder for consumers to use than the bottled ketchup so it wasn’t well received. On-the-go, convenient, single-serving items are a growing market. Items that travel well, can be quickly added to a lunch or grabbed for a snack are in demand. Protein is considered one of the biggest areas of potential growth for food manufacturers. High protein started with Greek yogurt and is finding its way into other products. First protein was added to frozen yogurt, and now everything from granola bars to vegetable dips and cheesecake has extra protein. Recently Kraft added twice the protein to their cream cheese. Consumers are looking for more high-protein foods with a renewed focus on breakfast. Some products aren’t adding extra protein but making what they already contain more noticeable by placing the information on the front label. The Baby Ruth candy bar has “4 grams of protein” placed prominently in the right corner of the front label. That’s the reason to buy a candy bar — for the protein. If you haven’t already come across it, KRAVE has come out with a line of gourmet flavored jerky. Now, this is not your grandfather’s jerky. Pineapple orange beef, black cherry barbecue pork, and basil citrus turkey are just three of the flavors of this low in fat and calories and high in protein jerky invented by entrepreneur Jon Sebastiani. KRAVE is preserved with sea salt and celery powder. It doesn’t contain any nitrates and is lower in sodium than typical jerky. The top flavor to date is sweet chipotle. More gluten-free products also are expected in 2014 as well as continued focus on ancient grains.